I developed this recipe in the cold days of December. A father had purchased an in-home cooking class for him and his daughter for Christmas. His daughter loves to bakes and he left the menu for the class entirely in her hands. I’ve taught hundreds of cooking classes and I always ask for suggestions from the client when I’m developing the menu. I like to know if they struggle with anything in the kitchen; if they fear pan-frying or if the thought of making homemade pastry dough intimidates them. I usually get a little feedback and then a request to just pull some ideas together for them to review. That wasn’t the case with this class. My client’s daughter is a 10-year old who knows what she wants. I caught her by phone and when I asked if she had any requests for her class, she responded with “cake pops, blueberry pie with a lattice crust, and chocolate eclairs.” I gently suggested a more seasonably appropriate pie (after all it was December and the only blueberries I was getting my hands on were from Chile), but she was adamant that blueberries were her favorite and she wanted to make a pie with a lattice crust. I acquiesced and have to admit that I enjoyed having a bit of summer in my kitchen in December. Now, with fresh local blueberries in abundance at my farmer’s market, I’m even more delighted to have this tested recipe ready to go. Happy baking! Place a large baking stone on a rack in the bottom third of the oven and preheat the oven to 425 degrees. 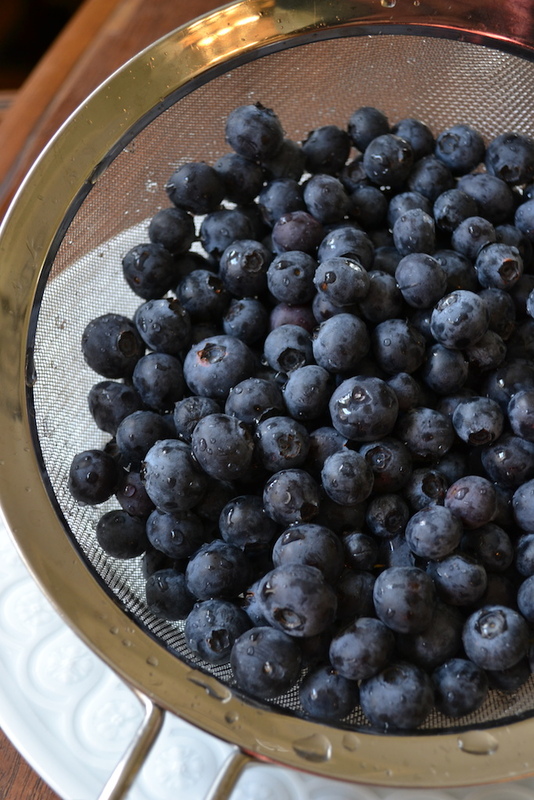 Combine the blueberries, sugar, lemon juice, lemon zest, cornstarch, and salt in a large bowl and toss to combine. Let the blueberry mixture sit for at least 10 minutes. On a lightly floured surface, roll out the chilled pastry dough for the bottom crust to ¼-inch thickness. Using your rolling pin, transfer the dough from the counter to the 9-inch pie plate. Trim around the edges as needed and patch up any holes. 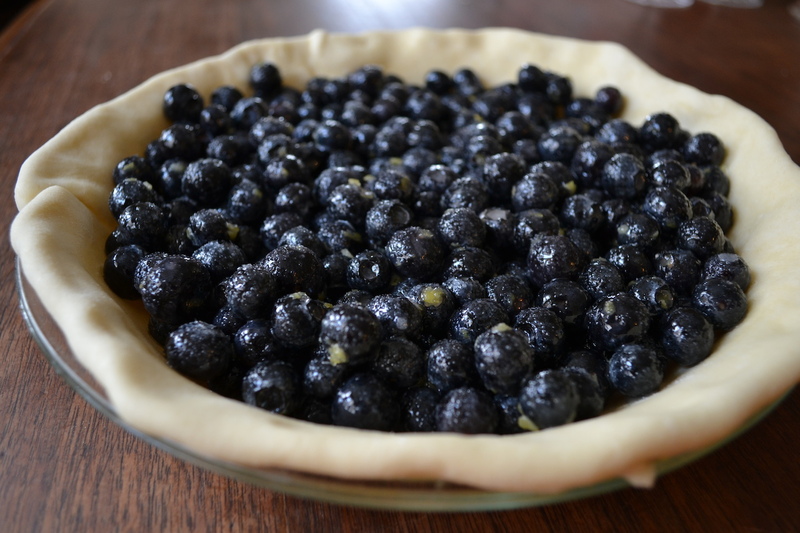 Pour the blueberry mixture on top of the pastry dough in the pie plate. Trim the excess dough and brush the edge with the egg wash. Place the pie in the fridge while working on the top crust. On a lightly floured surface, roll out the pastry dough for the top crust to ¼-inch thickness. Use a pastry wheel to cut ¾-inch wide long strips of dough. Arrange half the strips evenly over the filling. Carefully pull back every other strip a little past the center and place another strip perpendicular on top. Pull the turned back strips over the perpendicular strips and then pull back the strips that weren’t pulled back the first time around. Repeat this process, weaving new strips perpendicularly, until the pie is covered. For a pie where you can see the filling between the lattice, allow some space between strips. 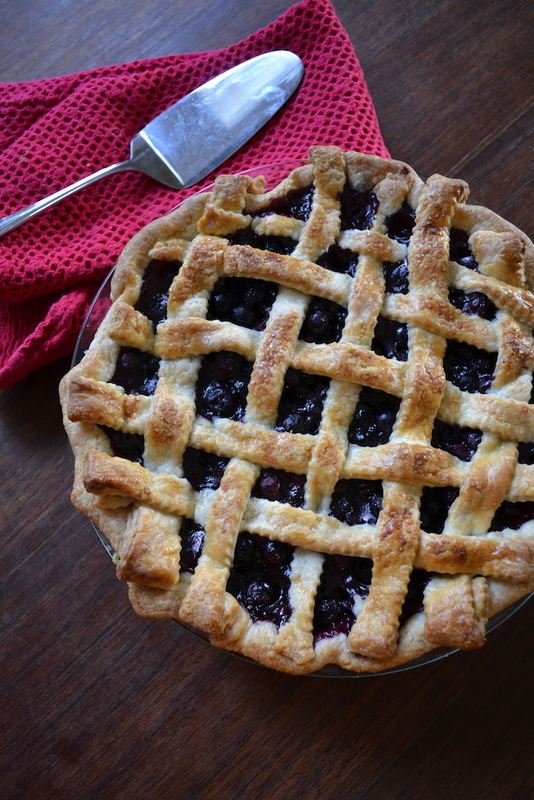 For a pie with a tight lattice, do not leave any space between the strips. Brush the lattice with the egg wash and sprinkle with granulated sugar. Chill in the fridge for twenty minutes if the pie dough seems soft. Place a piece of foil on the baking stone and place the pie atop it. Bake for 45 to 55 minutes or until the blueberry filling is slowly bubbling. Carefully remove the pie from the oven and allow it to cool before serving. In a large bowl, whisk together the flour and salt. Use two forks or a pastry blender to cut the butter into the flour mixture until the fat is in small lumps. Sprinkle the ice-cold water over the flour mixture and use a fork to pull the mixture together. Add up to 1 more tablespoon of water, in teaspoonfuls, if the dough is not coming together. Turn the dough out on the counter and, working quickly, mold it into a large ball. Press the ball into a 5-inch disc. Wrap the dough with plastic wrap and refrigerate it for at least thirty minutes and up to one day. Use according to the recipe. Lemon zest + blueberries = flavour heaven, can’t wait to try.